Fifteen months after 6,223 shark carcasses were found aboard a Chinese refrigeration ship in the Galapagos Marine Reserve, a former crew member of that ship has revealed that Fuzhou Honglong Ocean Aquatic Products was responsible for the sharks’ deaths. The admission solves the months-long mystery of how the refrigeration ship, which lacked fishing equipment, obtained the carcasses, which included baby sharks and endangered species with their fins cut off. The fishing ships now known to be the source of the illegal catch are owned by Pingtan Marine Enterprise Co. Ltd., a Nasdaq-listed company and China’s second-largest ocean fishing enterprise. Pingtan is owned by the same family that owns Honglong, and the two share an office address in Fuzhou, Fujian province’s capital. Zhuo Longjie, a major shareholder of Honglong, declined a telephone interview with Caixin. 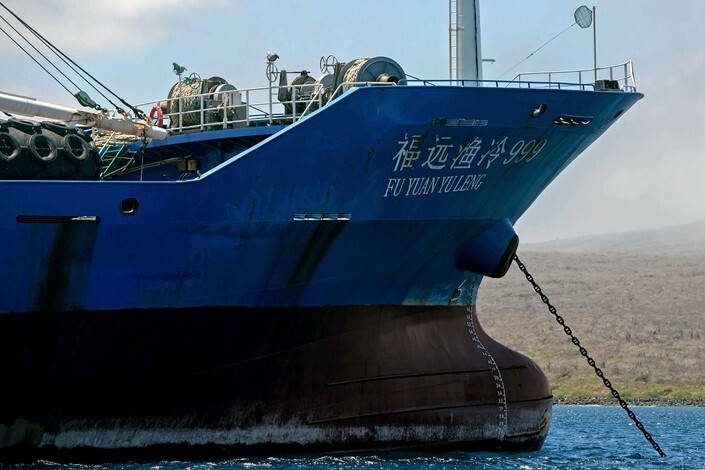 When the refrigeration ship was apprehended in August 2017 in Ecuador’s Galapagos Marine Reserve, the Galapagos authorities and China’s Ministry of Agriculture said that the smuggled cargo had been obtained from Taiwan-flagged fishing ships, which Taiwan’s fishery authority denied. A Caixin investigation at the time found that it had more likely come from four China-flagged fishing ships, owned by Fuzhou Honglong — a charge then denied by the company. The vessel and its crew were detained, and Ecuadorean courts found the captain and crew guilty of the possession and transport of protected species. They received prison sentences and were fined a total of $5.9 million. “The Taiwan boats were a fabrication,” the crew member, Huang Zhiqiang, told Caixin. Huang had returned from Ecuador in August after serving a yearlong prison sentence for his role in transporting the shark carcasses. “Around July 7, 2017, we set off from Fuzhou. About a month later, we started to transfer the sharks on the high seas,” he said. They had no contact with other fishing boats, he said. “At first, the company owner wanted our boat to go directly to Peru to load squid, but on the way to Peru, he told us that the boats fishing sharks were full, and we had to go to load the sharks first,” Huang said. Months after Caixin’s investigation, the Chinese Ministry of Agriculture halted the operations of Honglong’s 78 distant-water fishing vessels and ordered the company to suspend production. It also placed the Fu Yuan Yu Leng 999 on an industry blacklist. Huang told Caixin that he didn’t know where the fins were cut off. “We were responsible only for transporting the sharks back, nothing else,” he said. Huang said that the conditions in the Ecuadorian prison were terrible, and the crew members all had their belongings stolen. When they returned to China in August, Huang and some of the other crew members asked Honglong for compensation. Honglong refused on the grounds that the crew members’ labor contracts had expired. The incident reflects the complexities of distant-water fishing, which China is struggling to regulate. A recent international fishing industry survey showed that Chinese vessels are the most active and travel the furthest for their catch.